Good evening everyone and welcome to another of our team blog hops. This one will be projects using product you can earn FREE from the sale-a-bration catalogue and then next Monday we'll have another hop using products from the Occasions Catalogue. 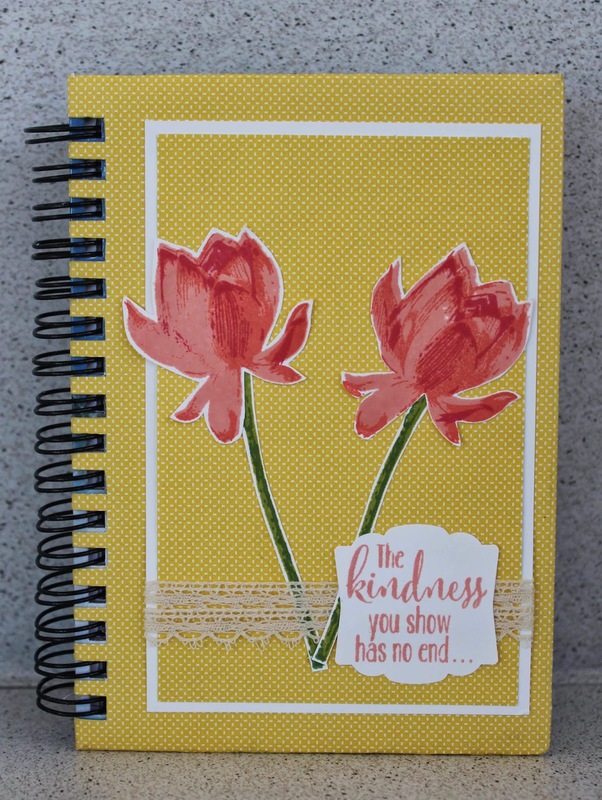 For my project I have repurposed a cheap notebook I had by covering it with designer series paper and using the flowers from the gorgeous Lotus Blossom stamp set. As always please leave us comments as you go along - we love to hear what you think!. If you've been following the blog hop you will have come from Alicia's blog . Your next stop is Bernie's page. If you get 'lost' there is a list of all the blogs at the bottom of this post. When you're ready click next to hop on over to Bernie's blog and I hope you enjoy all the fantastic projects our team have created. Don't forget to stop by at 8pm next Monday (26th) for the Occasions Catalogue Hop. Thank you for sharing. Your notebook is lovely especially with the fussing cutting. Nice work Kathryn. I bet it was a bit of work adding the cardstock around the wire and making it look so neat and tidy! You have more patience than me, with that and the fussy cutting. Love the use of the Venetian Crochet Trim, sew cute! Well done - your notebook looks great. I still haven't got round to using this set but after seeing all the lovely creations it might just get out of its case!